Volvo XC90 is known for its luxury, but does that go beyond looks? Absolutely. Here are two audio and technology features that add to SUV's popularity. Volvo Cars Cincinnati East knows that drivers have to stop for directions sometimes, but with Volvo's Sensus Navigation feature, there's no need. Using voice control or controls on the steering wheel, this feature gives road directions, offers alternate routes and free map updates and gives access to in-car apps. Talk about convenience. 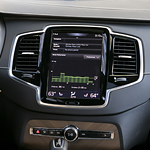 You get four free years of Volvo On Call service, which integrates with your smartphone. This feature includes an app that accesses your SUV's dashboard, lets you lock and unlock the doors and check your gas level. It also includes Engine Remote start and one button to call for roadside assistance. That can really come in handy if you ever have car troubles while driving around Cincinnati.